Dr. Rajora is the organizer and coordinator of a session entitled Genetics and Genomics for Conservation, Climate Adaptation and Sustainable Management of Forests to be presented at the IUFRO 125th Anniversary Congress in Freiburg, Germany in September. “Genetic diversity is the basis of all biodiversity,” he said. “It provides the raw material for survival, adaptation and evolution of all organisms, especially under changed environment, climate and disease conditions. This research is critical to understanding the biological functioning of forest trees, discovering genes, their sequences and functions and variants that control or affect growth, wood properties, adaptation, disease and insect resistance, he said. It’s also important to understanding genetic response of forest trees to natural and human disturbances, climate and environment change, among many other things, he added. “Understanding the biology of forest trees is critical to develop and implement any sound forest management plan. Can a physician, without knowing human biology, properly manage human health?” He asked. “The same question should apply to forest managers. Genes control many of the biological processes. Genetic diversity is the basis of forest sustainability because it provides the raw materials for species, populations and individuals to adapt and evolve, especially under changed environmental and disease conditions. “Genetic and genomics research has a crucial role to play in understanding the acclimation and adaptive responses of forest trees to climate change – the major environmental issue of our time – and in developing mitigation measures to address the climate change effects,” he said. Assisting ecological and economic sustainability of forest resources, and stability and functioning of forest ecosystems by conservation and sustainable management of forests under current and anticipated future climate change conditions. 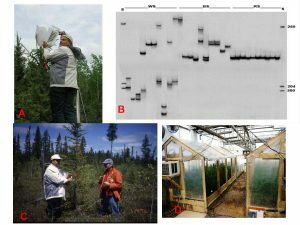 Genetics/genomics research is relatively expensive, he said, and it would be helpful if there was recognition by funding agencies that longer-term (many forest trees take several decades to produce advanced-generation pedigrees) and higher-levels of funding research commitment is necessary. It would also help to make genetic diversity assessment mandatory for ISO, FSC, SFI and CSA certification of sustainable forest management, he said. He hopes this session will help increase public and professional awareness of the huge role that forest genetics/genomics can play in conservation and sustainable management of forests and in dealing with climate change issues. And, Dr. Rajora said, it should be emphasized that all genetics and genomics research does not lead to genetically engineered trees. It is only one of the minor outcomes. “Deployment of genetically engineered trees within the natural forest is a major concern and should not be done,” he said. “Deployment of genetically engineered trees may have its own place, but in the planted forrest that is well isolated from the natural forest, or when all other options are exhausted. About 2000 scientists from 89 countries are expected to attend the Congress. The Genetics/Genomics session in Freiburg will be one of 172 scientific sessions that will cover a wide array of topics dealing with various aspects of forest research.